Ready to find your next sales development representative? Many of these skills aren’t captured on a resume and can’t be assessed through an interview process, especially those soft skills that often make the difference. In reality, the only way to evaluate these skills is when you see these candidates in action. Micro-Internships are a perfect, easy, low-risk and low investment way for employers to see candidates demonstrate these skills first hand. We would like you to research 15 companies that use one of our competitor’s services. Create a list in excel and use different tabs for each company. Provide a brief justification as to why you selected these specific companies. Use your research to decide what companies will make the final target list. Additionally, identify potential objections they might have to switching providers and provide suggestions on how to overcome them. We will provide a list of 50 companies attending an upcoming conference or event, and would like you to determine the name of the CEO or other executive, contact information for that individual, a brief description of the company's offering (ie market, product, etc. ), and recent press highlights. We will provide a list of 50 accounts from our target contact list. We would like for you to mine through these accounts and find commonalities amongst the account contact and the account rep tied to the account. We will provide a fact sheet for all account reps tied to accounts from the target list. Once commonalities are identified amongst the rep and contacts, draft a message that can be sent via LinkedIn to get the conversation started. If there aren't commonalities between the rep and contact lists, identify someone else within the account that could serve as a good intro. In order to help you pick the best candidate, you can ask a question or two to screen the applicants. While not required, this is a great way to quickly learn about the candidates so you can select the best Career Launcher for your project. Here are a few we would recommend. Tell me about a time you had to convince someone of something. Provide an example of one prospect we should approach and briefly describe why. Are you available to accept an internship or full time role? Please only apply if you are interested in the full-time role or internship following this initial project. While there may not be any “right” answer, these types of questions allow a Career Launcher to stand out by conveying an insightful perspective or passion for the role. As highlighted above, these assignments are a great way for you to assess if a Career Launcher has the Core Skills that are required to be successful in this role. 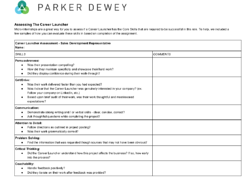 To help, we included a things to look for in what the Career Launcher provides. Download the full assessment here. Of course this is not just limited to sales roles. You can see some additional examples tied to other roles or departments here.